A Canadian soldier examines an automatic APC cannon before a drill in Yavoriv, Ukraine. Canadian trainers are helping Ukraine modernize its tactics to combat pro-Russian separatists. On Sept. 28 at 7 p.m. (ET), The Munk Debates will hold the first ever federal leaders' debate devoted to foreign affairs. The Globe and Mail is an official media partner of the Munk Debates. Click here for details on how to watch it live on globeandmail.com. It was the suddenly choppy tide of the eastern Aegean Sea that changed the course of Canada's election. The turquoise waters rose up during the night that became Sept. 2, overturning a flimsy dinghy full of refugees. As if calling on the world to pay attention, the angry waters then deposited the tiny, drowned body of three-year-old Alan Kurdi onto the otherwise pristine beach of a Turkish resort. A photograph of the little boy lying face down in the sand in his red T-shirt and blue shorts rattled consciences around the globe, starting an international debate about the four-year-old war in Syria, and how to deal with the hundreds of thousands of people fleeing the conflict. It also kickstarted a furious controversy about Canada's own approach toward asylum seekers, and thrust issues of foreign policy – as well as the country's changed reputation abroad – into the centre of the 42nd election campaign. 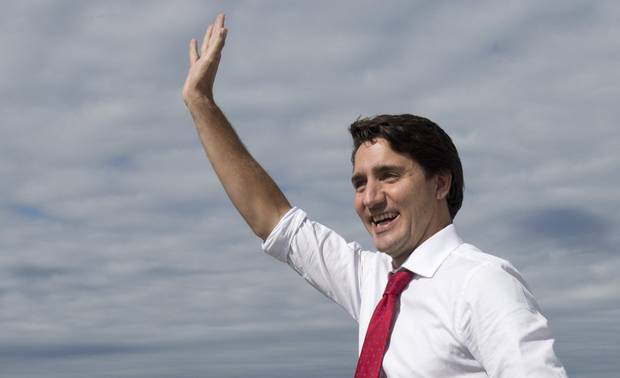 Suddenly, it's feasible that issues of war and peacemaking, as well as defence budgets, development aid, and refugee policy could play an unprecedented role in determining whom Canadians choose as their prime minister on Oct. 19. Many abroad say that the very ring of the word "Canada" is different after nine years of Conservative governments that have chosen to fight hard for a handful of select causes – Israel, Ukraine, maternal health – while downsizing the country's engagement with the rest of the world. Embassies in places such as Iran, Cambodia, Bosnia-Herzegovina, and Zambia were closed, aid funding was slashed, foreign governments were deliberately offended. The effectiveness of multilateral institutions such as the United Nations was, perhaps fairly, brought into question by the Harper government. Canada's international reputation took on a still dimmer hue when it emerged that Alan Kurdi's uncle, Mohammed, applied earlier this year for refugee status in Canada, where the family has relatives, but was rejected. The family has suggested that Alan's father, Abdullah Kurdi, made the regrettable decision to try to take his family to Greece by dinghy after realizing the legal route to Canada was blocked. The full tale is more complicated than that, but the lesson those walking from the Middle East to Europe have taken from the tragedy is that refugees like them are not wanted in Canada. "Canada is so big and so has so few people. Why doesn't Canada welcome us?" asked Waad Rawandas, a 31-year-old computer programmer and father of two, from the shattered northern Syrian city of Idlib, as we crossed by foot from Serbia into Croatia last week via a succession of farmers' fields. Perhaps a dozen Iraqis and Syrians walking alongside leaned in for an answer I didn't have. Canada's global posture under Stephen Harper has been marked by loud expressions of support for free trade, and for standing up for what Mr. Harper calls Canada's "principles" in places like Ukraine and in the fight against the so-called Islamic State. The elbows-up diplomacy – backed by military commitments – has Canada playing larger-than-life parts in the conflicts of Eastern Europe and the Middle East. "I think Canada is more relevant, broadly speaking," Defence Minister Jason Kenney, considered one of the chief architects of Conservative foreign policy, said in a June interview on the sidelines of a NATO meeting in Brussels. "I think we're on the right side of history when it comes to some of these issues." But just as fundamental to the Harper era has been a retreat from spheres – such as United Nations peacekeeping missions, and land-mine clearance – in which Canada once led the planet. Foreign-aid spending, which had already begun to fall in relation to the size of the economy under Liberal governments, started to decline even in real-dollar terms. And, fatefully, the rules for those hoping to obtain refugee status in Canada were tightened in 2012. "It's a changing world, and obviously we have to change with it. But there are certain things that we shouldn't change, and that I'm disappointed to see happening," said retired general John de Chastelain, who served as chief of defence staff under both Liberal and Progressive Conservative governments. Referring to the foreign policy of the past nine years, he added that "I don't know that sharper elbows really help very much. They may get you through a crowd, but you annoy a lot of people when you do that." Canada still frequently comes near the top of polls asking respondents which country they admire, or where they'd most like to live. But diplomats and aid workers around the world have told The Globe and Mail that they no longer see the country in the same light they did a decade ago. Several prominent Canadians interviewed for this article said they believe that whoever is prime minister after the election should convene a high-level panel to try to recalibrate the country's international positioning. And, perhaps, to undo some of the damage done. Tun Channareth, left, and Sister Denise Coghlan, from the International Campaign to Ban Landmines, stand in front of a crater made by a bomb dropped over Cambodia during its wartime years. Mr. Channareth, whose legs were severed by a landmine in 1982, travelled to Oslo in 1997 to receive the Nobel Peace Prize on behalf of the ICBL for its advocacy against landmines. Sister Denise Coghlan has fond memories of Canada. The long-time human-rights activist made her first visit in December, 1997, to attend the signing of the Ottawa Treaty, where 122 countries agreed to ban the use of antipersonnel mines. From there she flew straight to Oslo, where the International Campaign to Ban Landmines,which she helped to lead, won that year's Nobel Peace Prize. 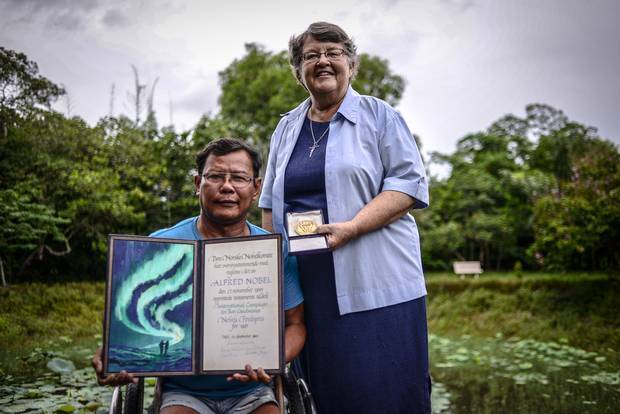 She keeps the Nobel diploma and medal she received in her office at the Jesuit Refugee Service compound she runs in this town built around the storied ruins of Angkor Wat. She's too busy to look at it much. Eighteen years after the signing of the Ottawa Treaty, Sister Coghlan spends most of her time working with land-mine survivors and lobbying countries to join the project she took on next, the 2008 Convention on Cluster Munitions. What's changed, the Australian-born nun says, is that she no longer feels campaigners like her have Canada's backing in their work. The Canadian government went from being an innovator and a host in 1997 to a foot-dragger on the cluster-bomb treaty, which Ottawa took seven years to ratify, and only after adding a loophole allowing the Canadian military to continue co-operating with armies (such as the United States') that continue to use cluster bombs. "It's very surprising how much Canadian policies have changed since 1997 … Canada was a beacon of disarmament, and I don't see that any more," Sister Coghlan said, speaking with The Globe and Mail on the quiet veranda of her Jesuit mission outside the cacophonous tourist town of Siem Reap. "For me, it's sad and disappointing. I think it's a misjudgment, and a lack of judgment about what the real moral issues in the world are." 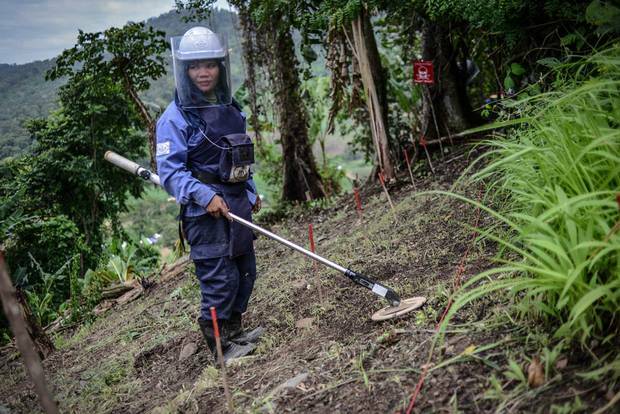 Sok Kanthy, 27, has been working as a deminer with the HALO Trust for two months. She uses an Ebinger GC tool to detect mines hidden in the ground. Choem Bo, HALO’s supervisor in Pailin province, prepares to enter a minefield. The crudely made steps cut into the side of the hill are the only safe place to walk; the red and white sticks mark land that has not been cleared. Canadian funding for land-mine clearance worldwide has dropped from a high of $49.2-million in 2007-08 to just $7.9-million in 2013-14, according to statistics provided by Mines Action Canada. Assistance to the effort in Cambodia – where there are still six to eight million pieces of unexploded ordnance on the ground, and someone steps on a land mine every three days – fell from upwards of $3-million a year to zero in 2013-14 before a single $692,236 grant was dispersed earlier this year. 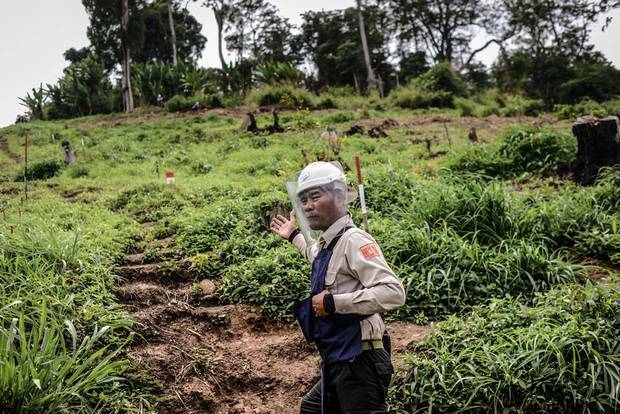 Heng Ratana, director-general of the Cambodian Mine Action Centre, said his organization had to lay off more than 300 deminers as a result of the fall in Canadian funding, dramatically slowing the pace of the ongoing work. He said the cut came as a particular surprise because his organization sees itself as the "child" of Canadian peacekeepers who worked in Cambodia in the 1990s helping the Cambodian government set up its own demining program. "Canada brought the world together to tackle this problem, and then suddenly pulled out," Mr. Heng Ratana said. It's not just land mines. Canada also closed its embassy to Phnom Penh in 2009, and cut off all bilateral development assistance to Cambodia and seven other countries in 2013. Julian Fantino – minister for the now-defunct Canadian International Development Agency – said Canada needed to focus its aid on countries where it served "Canada's values and interests." As Canada has drawn down its involvement in places such as Cambodia, the Conservative government has directed $2.85-billion over the past five years into a program to improve maternal and child health in 10 selected countries. That effort – which fits Mr. Harper's philosophy of a targeted foreign policy that aims to be more effective in chosen areas, rather than contributing widely via multilateral institutions – has been lauded for helping reduce the number of women and children who die during childbirth. Others, however, have criticized the government for allocating just 1.4 per cent of the funding to contraception and family planning for the millions of women who lack access to both. Funding for abortion is also specifically precluded from the effort. At a glance: What are we spending on foreign aid? Canada spends more on foreign aid now than we did 40 years ago – at least, as measured in raw dollars. But those increases haven't kept pace with our overall growth: As a percentage of the economy, we now spend far less than we used to. In raw dollar figures, Canada's global foreign-aid spending started to decline in 2011, when the Conservatives won their first majority government. Foreign-aid spending stood at $4.9-billion last year, down 14 per cent from a high of $5.7-billion three years before. But the drop can't be pinned solely on Mr. Harper's governments. Measured against the growing size of the Canadian economy, Canada's commitment to helping other countries has been falling since the 1980s – particularly dramatically during the period when Jean Chrétien was prime minister in the deficit-cutting 1990s. Derek Burney, a former chief of staff to Brian Mulroney who was hired to oversee the 2006 transition in the Prime Minister's Office from Paul Martin's team to Mr. Harper's, said Canada had no option but to narrow its focus. "We can't do everything. Even the U.S. can't do everything. We have to make choices. That's the essence of not just foreign policy but domestic policy." The effect those choices have had on Canada's reputation is harder to measure. But there's no question that the gap between how Canadians have traditionally perceived themselves, and how the world sees us now, has grown. Bill Morse, an American who runs the Cambodia Landmine Museum outside Siem Reap, said his museum (which charges visitors $5 U.S., and uses the money to fund land-mine safety classes and a demining team that works in rural areas) "wouldn't exist if it weren't for Canada," and specifically the support of the now-closed Canadian Embassy in Phnom Penh. Where Mr. Morse used to hear Canadian tourists lecture him about the ills of U.S. military involvement in Southeast Asia, he now turns the tables and shows them statistics about how little Canada does to help, compared with such countries as Japan and Norway, which now lead the anti-land-mine effort. "Everybody has noticed that Canada bailed out," he says, standing in front of his museum, where the maple leaf still flies in tribute to the country's former role. "The hardest thing in the world is to build up a good reputation. The easiest thing in the world is to lose it." Snipers undergo training in Yavoriv, Ukraine. In other parts of the world, Canada's reputation has never been finer. In Ukraine, officials and ordinary citizens alike gush with praise for the strong stance Canada has taken as their country has gone through revolution, the loss of territory, and civil war over the past 18 months. "Canada being here matters not only from a military point of view, but from a political point of view," said Col. Alexey Krasiuk, speaking after a ceremony marking the arrival this month of 200 Canadian military trainers in Ukraine, where they will help the army modernize its tactics for war against Russian-backed separatists in the eastern part of the country. "It's very important for morale. You understand that you are not alone, that you are surrounded by friends that are ready to help you." Gone is the almost serially neutral Canada that defined itself as a peacemaker and mediator, the country that once led the world in international peacekeeping deployments and which held itself out as a bridge between ideologies during the Cold War. The new Canada defines itself on the world stage by its lists of both friends and enemies. Under the Conservative governments, Israel, the Kurds and Ukraine have had no prouder friend than Canada; Iran, Islamic State and Vladimir Putin's Russia no louder enemies. 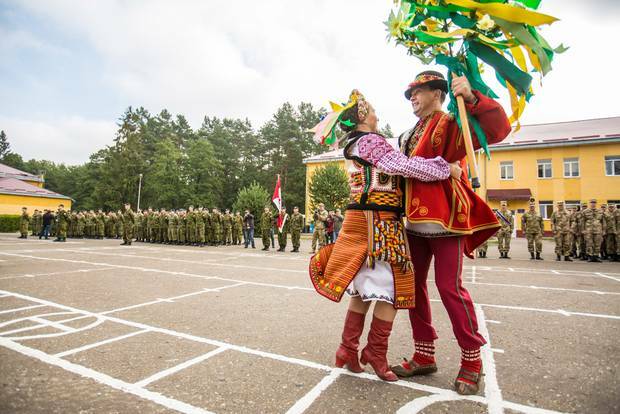 A dance ensemble from Ukraine’s Defence Ministry performs at the opening ceremonies for Operation Unifier, a Canadian training mission for Ukrainian soldiers. "Let there be more Stephen Harpers," read one headline in The Jerusalem Post last year, before the Prime Minister arrived in Israel for a state visit. Similar sentiment echoes in Erbil, the capital of the de facto Kurdistan growing in the north of Iraq, where Canadian special-forces soldiers are renowned for getting closer to the action than are other members of the multinational coalition helping the Kurds fight off the threat from Islamic State. 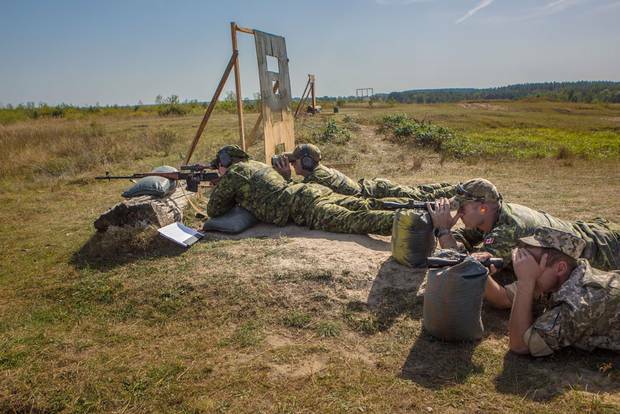 The training mission in western Ukraine is less controversial at home than is Canada's deployment of fighter jets and special forces in Iraq. But the arrival here of the 200 soldiers from the 1st Battalion of the Royal Canadian Regiment reflects Canada's surlier new role in the world. During the 1990s, soldiers of the Royal Canadian Regiment moved from peacekeeping deployment to peacekeeping deployment: Bosnia-Herzegovina, Kosovo and Haiti. Now its missions are decidedly edgier: The last place the 1st Battalion was deployed prior to Ukraine was Afghanistan. Canada is in Ukraine to bolster one side in the conflict, not to keep the two sides apart. And while the training is taking place some 1,200 kilometres from the front lines in eastern Ukraine, the Canadian soldiers are operating under the same security procedures as those fighting in northern Iraq: No names are worn on their uniforms, and media are instructed not to take any photos that show a soldier's entire face. In other words, there are those outside the gates of the Yavoriv training compound who may wish Canada ill. The Canada of 25 years ago didn't do wars. In 1990, we were the No. 1 contributing nation to UN peacekeeping missions, with 1,002 soldiers and police deployed in the field. Today, there are many more UN deployments, but just 116 Canadians taking part in them, ranking us the No. 68 contributor, just below Paraguay and above Mali. Oksana Wynnyckyj-Yusypovych, Canada's honorary consul to the western Ukrainian city of Lviv, says that the world has changed, and that Canada's foreign policy has appropriately changed along with it. "Twenty years ago, we had a different world," she said, in lauding the Harper government's decision to send troops to Ukraine. "Ukraine is not a part of NATO, but today we see Ukraine as an ally, and allies train each other." Canada has also joined the United States and the European Union in slapping sanctions on a long list of Russian companies and individuals seen as having played a role in either the annexation of Crimea or the Kremlin's support for the separatists in eastern Ukraine. Mr. de Chastelain, who was chief negotiator for the Northern Ireland peace process in the 1990s, said he's not sure that the "slightly more belligerent pose" struck by the Harper government is as un-Canadian as some critics allege. Canada's participation in Afghanistan was highly valued by NATO allies, he said, as is the role that the military is playing in the war against Islamic State in Iraq and Syria. Similarly, he called the training mission in Yavoriv "extremely appropriate" given Canada's historic relationship with Ukraine. But Canada's outspoken support for Ukraine – crystallized by Mr. Harper's brief and confrontational meeting with Mr. Putin at last year's G20 summit, where Mr. Harper told the Russian leader "I have only one thing to say to you: You need to get out of Ukraine" – has come with costs. Russian lawmaker Alexey Pushkov, the influential head of the State Duma's foreign-relations committee, recently branded Canada "the most anti-Russian state in the Western alliance," and called for Moscow, which already bans the import of most agricultural goods from Canada and other Western countries, to develop special sanctions targeting Canada. Mr. de Chastelain, meanwhile, is bothered by the way rhetoric from Conservative cabinet ministers often eclipses Canada's actions on the ground in Ukraine and elsewhere. He said that Canada's military was under increasing strain because the rising number of commitments haven't been matched by a rising budget. Canada's military spending is currently near 1 per cent of GDP, or half the level that NATO asks member countries to maintain. "You're supposed to talk softly and carry a big stick. But it seems to me that we have been talking loudly and increasingly carrying only a twig. I think we need to stand up for what we think is right, and for what our allies think is right, but we must have the resources commensurate with our wish to be involved." 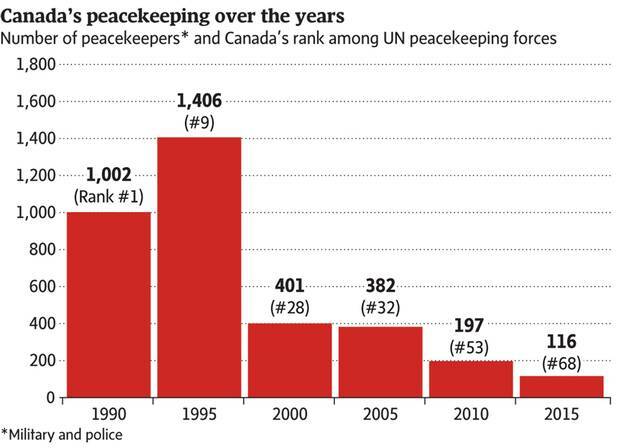 As it stands now, he added, it was unlikely Canada had the spare military capability to take part in a large new peacekeeping mission, if it were asked to do so by the UN. 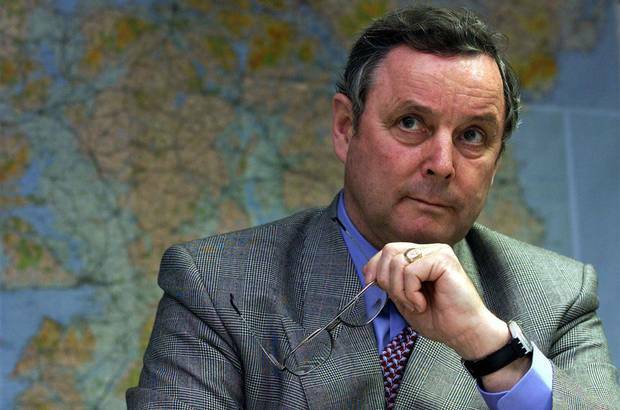 Canadian general John de Chastelain is shown in his Belfast office in October, 2001. Mr. de Chastelain is also critical of the fact that Canada is dropping bombs on Islamic State-controlled parts of Iraq and Syria without playing any significant role in trying to resolve the years-old civil conflicts roiling both Iraq and Syria. "I think we need to be well represented diplomatically," he said, referring to the fact that Canada has only a single diplomat permanently stationed in Iraq. "That's how we demonstrate to those countries that we take their interests seriously. The military is just an adjunct of foreign policy." It's a criticism widely shared by Canada's own diplomats, who are barred from speaking on the record without specific permission from Ottawa but are broadly critical of Canada's foreign policy in off-the-record moments. John Mundy, who served as Canada's last ambassador to Iran, said the Harper government's 2012 decision to shut down the Canadian embassy in Tehran – at a time when Canada was simultaneously trying to play a larger role in the Middle East – was emblematic of how Ottawa now undervalues and underutilizes its diplomats. "We're fighting a war in Syria and Iraq [where] Iran is one of the most important players. What Iran's intentions are is essential to the conclusion of the military effort, and we have chosen to be blind on the ground there. Why would we do that?" The day Stephen Harper first put his stamp on Canada's foreign policy came just seven weeks after he first took office as Prime Minister. It was March 29, 2006, when Canada became the first country in the world – after Israel – to slap sanctions on the newly elected Hamas government and to cut aid to the Palestinian Authority, moving even faster than the famously pro-Israel Bush administration then in the White House. Hamas had just won an election praised by observers as the fairest ever held in the Arab world. But the new Canada didn't deal with those it considered "terrorists." Three years later, Canada would further alienate many Palestinians, and ingratiate itself to Israel's political right, by defunding the core programs of the United Nations Relief and Works Agency, which serves the 650,000 Palestinian refugees scattered around the Middle East. "Canada and the Palestinians used to be very close friends," Nasser Shaer, a Hamas member who had just been sworn in as deputy prime minister of the Palestinian Authority, told me the day after Canada announced sanctions against his government. "What's happening? What's going on?" he asked. Those last questions were ones I would hear again two years later, when I moved from Jerusalem to Beijing and met with Chinese officials bewildered by a series of gestures from the Harper government – from Mr. Harper's skipping the Beijing Olympics to the government's bestowing honorary citizenship on the Dalai Lama – that they saw as unnecessarily antagonistic. But within 12 months, after the government took a battering from Canadian businesses feeling the chill in relations, it was Chinese activists who were asking what happened to Canada. Trade concerns won out and Mr. Harper made a penitent trip to Beijing, where human-rights issues were absent from the bilateral agenda. On a later trip to China, the Prime Minister refused to publicly mention the name of Chinese dissident and Nobel Peace Prize laureate Liu Xiaobo. Russian and Iranian officials – Canada's rhetorical enemies du jour – now ask the same "What happened to Canada?" question. In private, many Canadian diplomats who are posted abroad whisper similar thoughts. "I don't think it's a secret that they feel nobody's listening to them," Mr. Mundy said of the diplomatic corps, acknowledging that some veteran diplomats had initially been ideologically opposed to what the Conservatives were trying to do on the international stage. Those who disagreed most strongly quit their jobs, the now-retired Mr. Mundy said, including himself in that group. Those who stayed on remain willing to carry out the government's agenda, but feel excluded from the policymaking process. Environmentalists remain similarly in shock over Canada's 2011 decision to withdraw from the 1997 Kyoto Protocol on curbing greenhouse-gas emissions. The Canada that brought the world together in 1987 to sign the Montreal Protocol to combat ozone-depleting substances seemed to have changed almost unrecognizably. But Mr. Burney, the former chief of staff to Mr. Mulroney, says many of those nostalgic for Canada's former role in the world over-romanticize the part Canada once played, and overstate the impact it could have on the world stage now. He said Canadians should be debating their role in a world where the influence of the United States is declining, while China's power grows. Those bilateral relationships are now far more important to Canadian interests than what went on at the UN, which Mr. Burney called a "hurting" institution. "I'm always troubled by these the-world-needs-more-Canada analyses," said Mr. Burney, a former ambassador to South Korea and the United States. He said the next government should spend less time fretting about foreign aid than about foreign trade. Mr. Burney gave the government high marks for pursuing a free-trade agenda, though he noted it hadn't yet borne enough fruit. A free-trade deal with the European Union has been agreed to, but hasn't been ratified by the European Parliament, while Canada's negotiations to join the Trans-Pacific Partnership have been hampered by disputes over the automobile and dairy sectors. Meanwhile, Canadian exports have declined as a share of the country's gross domestic product, from 37 per cent in 2005 – and a high of more than 44 per cent in 2000 – to 31.6 per cent in 2014. Imports as a share of GDP remained relatively stable over the same period. Louise Arbour, who was UN High Commissioner for Human Rights when the Conservatives won their first election, had her own moment when she realized Canada was now marching to a different step, deserting its long-held commitment to multilateralism. 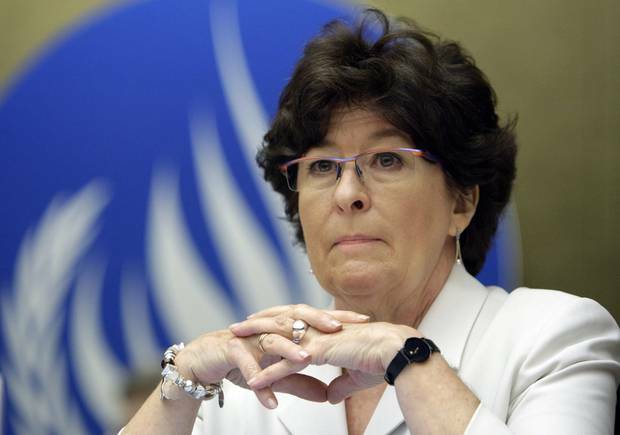 She was in the middle of pushing through a reform to replace the oft-criticized UN Commission on Human Rights with a smaller Human Rights Council, and thought by early 2006 that she and her colleagues had finally reached a consensus allowing them to proceed. Only when she couldn't get then-foreign minister Peter MacKay to answer her phone calls did she realize that the new Canadian government intended to force a vote – one it knew it would lose – so that it could register its displeasure that countries with poor human-rights records could still win seats on the proposed new body, even though the reforms would make it more difficult. "Canada, to everybody's surprise, became the sole dissenter. … That in itself is completely bizarre. Canada can't play alone. The U.S. can do that, China can do that, maybe Russia. But not Canada, and not Sweden for that matter," Ms. Arbour said. "At the time, I thought it was inexperience. But it became clear that it was a way of doing business, that Canada was unwilling to yield on certain things to create a consensus." Louise Arbour is shown at the United Nations headquarters in Geneva on June 2, 2008. Ms. Arbour, a former Supreme Court justice, accused the Conservatives of abandoning Canada's traditional roles of being a mediator and consensus-builder within multilateral institutions. As a result, she said, Canada lost influence and struggled to achieve even the narrower set of aims – including women's maternal health and gay rights – that the Harper government had prioritized. "The only way you're going to be successful is to be strategic. The only way to promote these issues in hard environments is if you're otherwise seen as a player by these governments on issues that are important to them," she said. "To always object because you claim it's a matter of principle is very disrespectful of others – as if you're the only one who has principles." She and former ambassador Mundy both contend that Canada's loud pro-Israel stance over the past nine years cost Canada friends in the Arab world and Africa. Those countries voted against Canada in 2010, when it lost a vote to Portugal for a seat on the UN Security Council. Ms. Arbour believes Canada could have been a more useful friend to Israel had it not alienated the Arab world, and yet been able to back Israel not just with words, but with its vote at the Security Council. Mr. Kenney rejects the entire line of thinking. "There's been a meme in the foreign-policy commentariat in Canada that our Conservative government has somehow created a lot of animosity toward Canada, for instance in the Middle East, by being unapologetically an ally of Israel," he said in the June interview. "I think that meme of criticism is massively exaggerated. I don't think the ordinary Russian on the street has a bad impression of Canada. To the contrary. And I'll tell you this: In Iran, the people whose opinions I value are the young Iranians who will some day in the future be leading a democratic Iran, who will some day find a way to overcome the oppression of this theocracy. And they will remember, they will remember, who was strongly in solidarity with the democratic aspirations of the Iranian people." 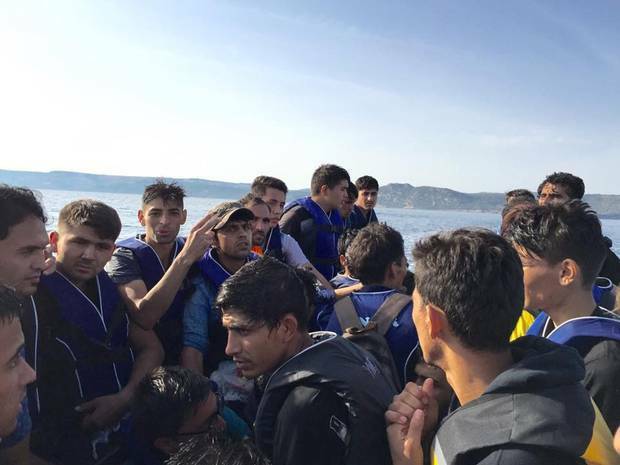 A photo taken by Mikahil Akbary, a 21-year-old law graduate from Afghanistan, shows his dinghy trip with 47 others to the Greek island of Lesbos. His relatives in Canada say it’s ‘impossible’ to bring Mikahil and his sister in under current asylum rules. As the photograph of Alan Kurdi lying on the beach reverberated around the world, a small group of Afghan refugees squatted on a floor of cardboard and thin blankets laid outside Bodrum's main train station. Despite the now very evident risks the journey posed, they were planning the next day to buy their own dinghy and to attempt the same dangerous crossing to the Greek island of Kos. Among the Afghans was 21-year-old Mikahil Akbary, a recent law-school graduate from the Takhar Province in northern Afghanistan. Remaining in Afghanistan was pointless, he told me, for he saw no future practising law in a country he was sure would soon fall into the grips of either the Taliban or Islamic State. His father, the head of the Red Crescent Society in Takhar, had urged Mikahil and his 25-year-old sister Sweeta to flee after the family had received threats. Mikahil and Sweeta, along with Sweeta's husband and their one-year-old daughter, Aysuda, flew this summer to the Turkish capital of Ankara, where they were granted tourist visas. But Turkey was never the goal. Like so many in the tide of refugees pushing into Europe from the Middle East and Central Asia, they wanted to get to Germany. Like the Kurdis, Mikahil and Sweeta have family in Canada – an aunt in Calgary and an uncle in Kitchener, Ont. Like the Kurdis, they saw the route to Canada as blocked by bureaucratic requirements for documents they didn't have. So they decided to risk their lives trying to reach Europe. "I love Canada, I love the role of Canada [in Afghanistan]. It's my dream to live in Canada," Mikahil wrote via Facebook Messenger as he and his family made their journey north. They were rebuffed in Bodrum, where Turkish police started cracking down on the dinghy armada after the publicity that followed the Kurdi family deaths, so they headed north, first to Istanbul, then to the port of Cannakale. 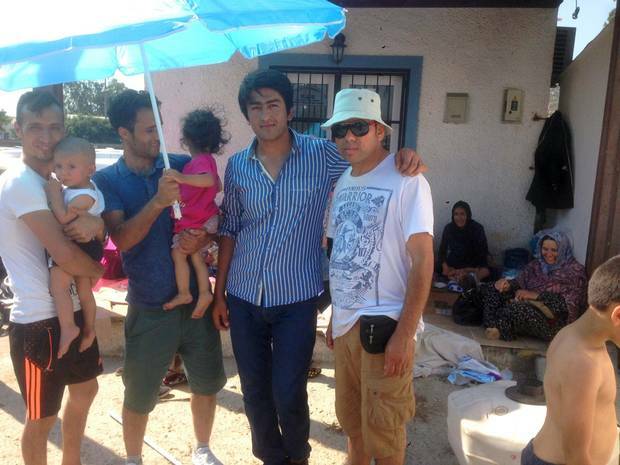 Mikahil Akbary, second from right, stands with some of his travelling companions – all from Afghanistan – in Bodrum, Turkey. The Akbarys paid $1,000 (U.S.) each for spaces on a tiny boat from there to the Greek island of Lesbos that a people-smuggler packed with 48 people. From Lesbos, Greek authorities permitted the Afghans to pass quickly to Athens, where on Sept. 15 they bought tickets on a bus bound for Macedonia. Then, they made their way overland to the Serbia-Croatia border, where little Aysuda fell ill and was admitted to hospital. The family was separated as Mikahil was told by Croatian police to keep moving on. The Akbarys seem to be precisely the kind of immigrants Canada says it wants. Well educated and secular (Sweeta is a medical student, and one who smiles happily for a male photographer, only a loose scarf covering her head), and with relatives already in the country who could help them financially as they settle. By this week Mikahil had finally reached Germany, while his sister and her family had made it to Austria. They were debating whether they should formally apply for asylum in Germany, which seemed to be struggling to handle the sheer number of new arrivals, or try Switzerland or the United Kingdom instead. Their aunt was still racked with guilt over not being able to bring her nephew and niece to Canada. "When they asked me to sponsor Mikahil and his sister, I said it's impossible," said Humairo Hassani, who has lived in Calgary for nearly a decade. She sobbed with anxiety as she spoke by telephone. "I researched a lot how to sponsor them, but there are a lot of rules, and [Mikahil and Sweeta] don't match any of them." Such barriers may fall fast, as debate over Canada's refugee policy remains at the heart of the election campaign. Immigration Minister Chris Alexander recently announced that a re-elected Conservative government would speed up the refugee application process from three years to 15 months, and no longer require asylum seekers to first prove they are UN-registered refugees, removing the hurdle that blocked the Kurdi family. Mr. Mundy said the next government – whatever its shape – needs to "rebalance" its stances in the world. "We were a country that was known as being helpful on key international issues. I don't think we're seen that way any longer." Ms. Arbour said the refugee issue – and the way public response to the crisis has forced the parties to make it central to their election campaigns – showed the "disconnect" between Canada's current foreign policy and how most Canadians wanted their country to behave on the international stage. "It took a long time to change our image, for people to realize that there was a change in the way that Canada plays globally," she said with a sigh. "It will take just as long for us to regain that ground." Over the past 18 months, Mark MacKinnon has travelled with the tide of Middle Eastern refugees from Turkey, through the islands of Greece and the Balkans, to the borders of the Europe Union. As well, he has reported from the scene during revolution and war in Ukraine and Crimea, as the latter was being annexed by Russian soldiers. He also covered the Charlie Hebdo shootings in Paris, the recent bombing in Bangkok, the British elections and the Scottish referendum. A foreign correspondent for The Globe and Mail since 2002, he has been posted to Moscow, Jerusalem and Beijing. In 2013, he was named the newspaper's senior international correspondent, based in London. Each assignment has given him a different perspective on Canada's evolving relationship with the world. He reported on the Canadian military missions in Afghanistan, Northern Iraq and Ukraine, as well as the 2003 U.S. invasion of Iraq, Russia's wars in Chechnya and the 2006 clash between Israel and Hezbollah. He also has covered the rise of Vladimir Putin, and the recent handover of power within the Communist Party of China. A five-time winner of the National Newspaper Award, Mr. MacKinnon is the author of The New Cold War, published in 2007, and has repeatedly been named by both the U.S.-based Foreign Policy magazine and the Canadian International Centre as one of the most influential foreign-policy voices on Twitter. Liberals look back fondly on how prime ministers of their own stripe viewed foreign affairs, and decry the Conservative government for embracing policies they describe as ideological, parochial and narrow. "We will take the approach of Canada trying to be a useful and helpful player on the world stage," says Marc Garneau, the Liberal foreign-affairs critic. "It is something that we have had a good reputation of doing in the past, and that reputation has been eroded in the past nine years." The Liberals say Canada's reputation has been diminished by the Conservatives, who make no apologies for picking sides and standing firm in the face of international opposition, and that their response on issues like climate has made Canada a pariah. And yet, on some key foreign focal points, including Israel and Ukraine, their views align closely with those of Stephen Harper and the Conservatives. Leader Justin Trudeau says his party stands firm with the Ukrainians in their fight against Russian-backed rebels. 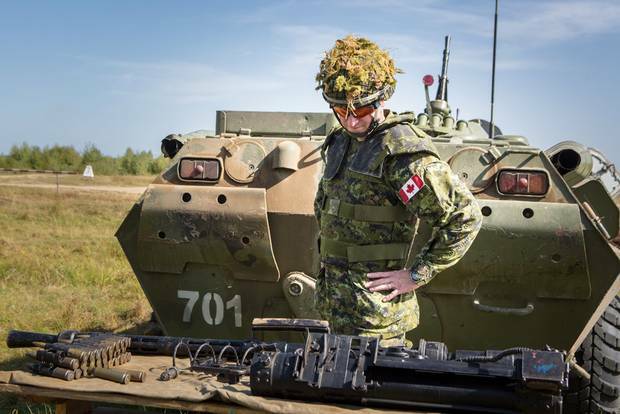 He also supports both the efforts of the Canadian military to train Ukrainian troops and the reassurance mission that has seen NATO countries deploy ships, aircraft and troops in neighbouring countries to promote stability in the region. As well, Mr. Trudeau backs sanctions imposed by the Conservative government on those who have supported the Ukrainian rebels, and would extend them to other individuals and some Russian financial institutions. Like the Conservatives, Mr. Trudeau has been a strong backer of Israel. He favours the "two-state solution" – creating a separate Palestine – endorsed by Mr. Harper. And he says he would offer Canada's help in bringing the two sides to the table. But there are differences the Liberals say set them far apart from the policies of the Harper Conservatives. For example, Mr. Garneau says, they would take a less antagonistic approach to dealing with multilateral bodies, including the United Nations. And in Iraq and Syria, Mr. Trudeau says, his government would end Canada's bombing mission against the Islamic State – a mission entered into by Mr. Harper. He would instead bolster Canadian military personnel helping to train Iraqi soldiers in the fight, saying Canada should take advantage of its demonstrated ability to teach foreign fighters. The Liberals also say they would immediately expand the number of government-sponsored Syrian refugees entering Canada to 25,000, invest at least an additional $100-million in this fiscal year to increase refugee processing and help with settlement, and provide a similar sum to the United Nations High Commission for Refugees to support its relief activities. Unlike the New Democrats, the Liberals are not promising to meet the UN goal of spending 0.7 per cent of Canada's gross national income on foreign aid. But "we do want to reverse the decline under the Conservatives of the amount of money for international development," Mr. Garneau says, adding that his party will announce how much it would spend – and where – before election day. One promise: "There will be a focus on Africa. That is a continent that, back in the Chrétien years, we focused on a lot." But the biggest difference between Liberal and Conservative policies on foreign affairs may be philosophical. Under the Liberals, says Mr. Garneau, international development would no longer be tied to economic opportunity. "Sometimes," he explains, it is "strictly for the development of the country, and there are not economic strings attached." New Democrats say they would take a more even-handed approach to foreign affairs than the country has seen under the Conservatives – one that puts less emphasis on combat and more on becoming a broker for international peace. 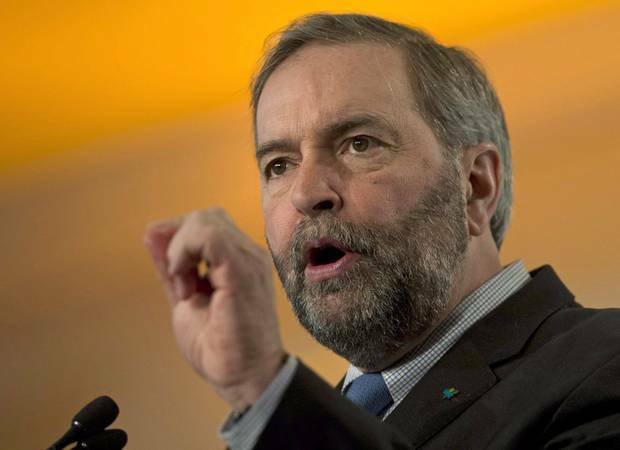 Leader Thomas Mulcair said last May that, as prime minister, he would increase Canada's foreign aid to meet the United Nations' goal of 0.7 per cent of gross national income. That pledge was missing from a costing document released this month, but New Democrats insist it has not been forgotten. Party foreign-affairs critic Paul Dewar says that 0.7 per cent remains an objective, and "we are going to reverse the trend" that has seen the figure drop under the Tories to where it now stands at just 0.24 per cent. On the situation in the Middle East, Mr. Mulcair has declared the firing of Hamas rockets at civilian populations to be "utterly unacceptable." But he has also expressed concern for the safety of Palestinians and favours a two-state solution to the dispute with Israel. Mr. Dewar points out that, unlike the Liberals and the Conservatives, the NDP supported the Palestinians' request for observer status at the United Nations and did not oppose their application to join the International Criminal Court. As for Ukraine, Mr. Mulcair agrees with the Conservative decision to back President Petro Poroshenko in his fight with Russian-backed rebels. He also supports the sanctions and travel bans Ottawa has placed on Russians and Ukrainians who are deemed to be responsible for the crisis, and would extend those measures to Igor Sechin, head of Russia's giant state oil company Rosneft, and Vladimir Yakunin, former head of Russian Railways. Both are allies of President Vladimir Putin, and have business ties to Canada. The NDP would leave in place the 200 members of the armed forces sent to train Ukrainian soldiers – but reduce Canada's military footprint in another world hot spot. A government led by Mr. Mulcair would immediately end the bombing campaign in Iraq and Syria, and bring Canadian troops home. Instead, the NDP Leader says, he would help Canada's allies by fighting radicalization at home and stopping the flow of fighters, arms and money to the Islamic State. As for the millions of Syrians fleeing the region, the New Democrats call for more humanitarian assistance, and say they would admit 10,000 government-sponsored refugees before the end of this year, followed by 9,000 a year after that. They also would lift the cap on private sponsorship, eliminate quotas, and treat all asylum-seekers equally. Mr. Dewar says an NDP government would increase Canada's contributions to world peacekeeping, and be more engaged than either the Conservatives or the Liberals on the issue of nuclear disarmament and nuclear non-proliferation. And, he adds, "we have a much more robust policy on corporate responsibility. Our trade policy and corporate social responsibility would go hand in hand."